There wasn't a hole lot of riding this weekend, but I did get myself out to Hack Cycle. This was an event at the West Seattle Summerfest put on by my friend Rusty. The idea was simple, get old bikes nobody wants and create new, fun, relitiviely safe contraptions for people to ride on with human powered tools. So that is where I was most of Saturday and Sunday. Not all the tools were human powered. The best one was the human powered bandsaw. It worked great, but when you wanted to cut something you had to roust up someone standing around to help. Next year I think this is something that needs to be more inviting. People would come and look at bikes being hacked on, but we really needed to drag more people right off the street to help Frankenstein a bike. I spent most of my time with an angle grinder and or a MIG welder. The electric tools weren't really human powered though. Rusty had a generator set up, but we didn't have the right (i.e. : huge) battery to really make it work. Plus it would have been better to have teams of people ready to spend a couple hours pedaling. Next year. A bunch of fun stuff was created. A couple of tall bikes. Some weird stork bikes. Of the bikes created (which for some idiotic reason I didn't get pictures of) my favorite was the one dubbed "The Argument". 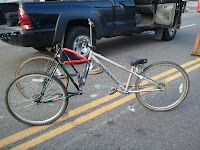 It was simply two bikes welded together side by side. 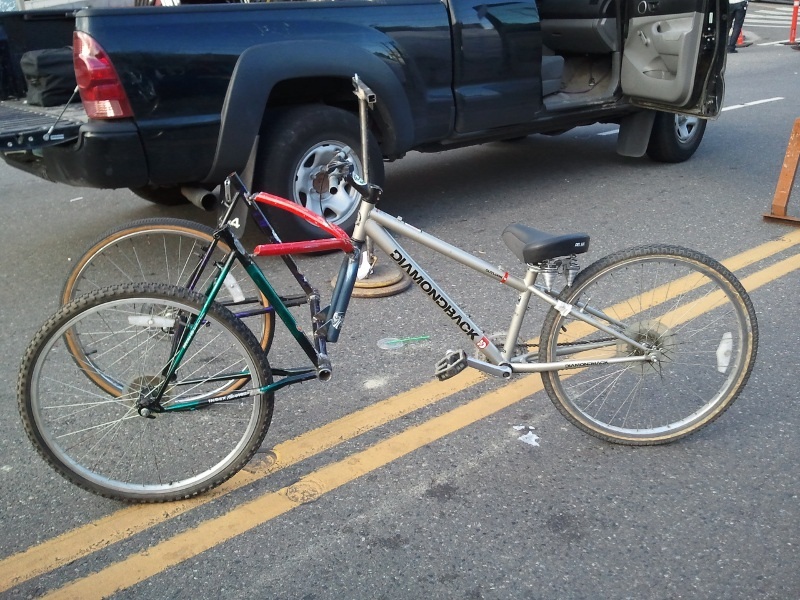 The left bike had pedals for power and half of a handle bar. The right side had one pedal and control of the breaks. It worked well enough but wasn't really anything that I would call efficient. That was kind of the point though. At that point it become mobile interactive art. As Rusty said "released into the wild". The last time I saw it was headed southbound on California being ridden by three (white) guys yelling "kill whitey". Bravo young lads! On Sunday I got my rear triangles cut and ground down. I also reused the top and down tubes from one of the Magnas to weld the two together. I added a small fork and some braces. Things were looking pretty good. I scrounged up some tires for the front. I just needed a unmodified frame to attach to the fork mounted on the front. Then a wasted a bunch of time trying to re-pin the chain. It did all come together. Sadly what I had created was much more akin to a DEATH TRAP. Rusty described it as a very innocent but angry piece of steel. It may not look like it, but you can't turn more than about 3 degrees without the bike trying to fall over. Because of the caster angle of that steerer tube the when you turn the front tires it pushes the back tire over at an angle until you fall over. So basically you can't turn the thing, and even holding it stead is a challenge. With a little more shop time I could have cut the steerer tube and welded it back at a 90 degree angle. That should keep it from trying to fall over all the time. But I ran out of time. I helped everyone get all the stuff loaded onto trucks and back to Hazard Factory. We also discusses plans for mobile interactive art and what to do at next year's Hack Cycle. Hopefully I will see some of you there. The Tour de France; or Why do I Care?